If your internet connection fails, you have the ability to process transactions offline until they can be pushed through with an internet connection. First, you must enable offline mode. Please note that this will not verify card information, it simply captures information until it can be pushed through with an internet connection. Therefore, you must accept risk for all disputed and/or rejected transactions. 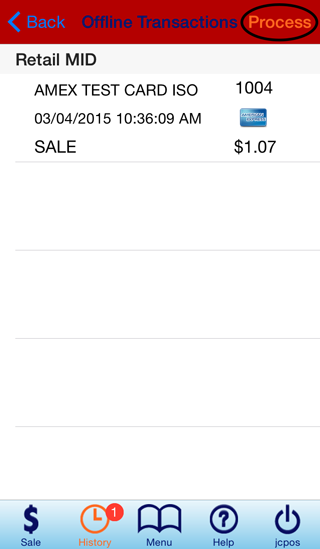 In the Mobile Settings section at the top, click the radio button next to On for Enable Store & Forward. In the Optional Cardholder Information section, mark off the radio buttons in the Require when swiping column next to Phone Number and/or Email Address to make them required, and click "Save Settings". If "Automatically Email Customer Receipt" is turned ON, the customer will get an emailed receipt after the offline transaction is submitted for processing and approved. Log into the 1stPayMobile using your User PIN. In the bottom menu, tap Menu. 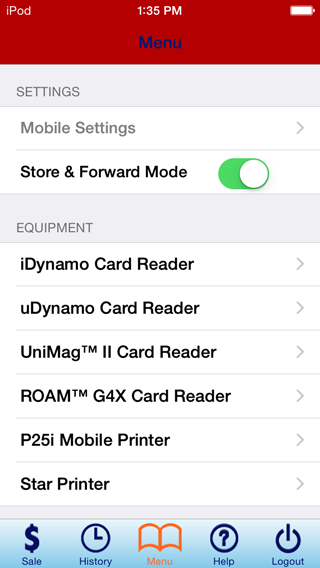 Under Settings, you will see Store & Forward Mode, with a toggle switch next to it. Tap the switch to turn it on. A popup box will appear stating, "Entering Offline Mode. Merchant Accepts risk for all disputed and/or rejected transactions." Tap OK. The top bar will turn red to signify offline mode. From the Sale Screen, enter a transaction as usual. The main difference in Offline Mode processing will be that instead of receiving an Approved or Declined message for transactions, the Authorization Response will always be "Pending". While in offline mode, you cannot access certain functions like Mobile Settings or History. Note: All offline transactions must be manually processed once an internet connection is available. Read below for instructions. In the bottom menu, tap History. Tap 'Process' in the top right corner. A popup will appear confirming that you are ready to process. Tap OK. The Transaction Results Summary will appear. A green checkmark indicates an approved transaction, and a red X indicates a declined transaction. Declined transactions may be resubmitted for processing, or deleted. To delete, select Failed Offline Transactions from the History Screen. 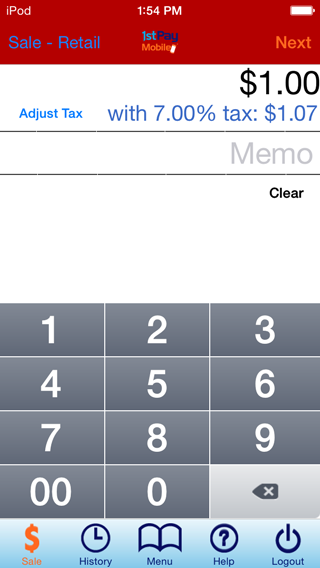 Tap Edit, then delete all desired transactions.